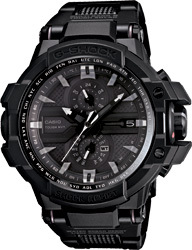 These new models are the new additions to the Gravity Defier lineup of timepieces preferred by pilots the world over. Triple g Resist construction makes them able to withstand the shock of gravitational dropping forces, centrifugal G-forces, and vibration. smart Access capabilities enable intuitive, simple-to-master operation, and a temperature sensor provides temperature readings at a glance. Time calibration signal reception can be turned on or off, which enables use as a normal watch were a time calibration signal cannot be received. A new type of resin bracelet type band use “Fine Resin”* square elements combined with steel-embedded H-shape elements, which enables both light weight than metal without sacrificing durability. The bracelet configuration also provides a better fit than standard resin bands. 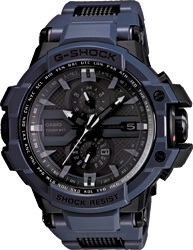 All of this and much more makes these watches the ultimate in good looks and G-SHOCK durability.